FATIGUE takes top spot on injury culprit list! Most experts agree that one of the leading causes of running injuries is “fatigue”. The roots of most of this fatigue can be traced to our normal everyday routines and NOT our running. The average runner in our country clocks around 12-15 miles/week. Compared to the 45-65 weekly hours they spend working, commuting, running errands, taking care of personal and family things, you quickly realize that running is probably not the cause of fatigue. Running while fatigued quickly leads to poor and inefficient gait mechanics, which in turn sets up the perfect scenario for an injury like a stress fracture, Tendonitis or a hip and knee issue! Wear supportive shoes throughout the day…make sure they have good arch support and the outsole heels are in good shape. Flip flops, sandals, and soft flexible shoes, even though they feel “very comfortable”, actually tend to make our feet and bodies work harder, therefore making us more tired! Properly hydrate throughout the day. This is probably one of the most neglected aspects of our daily routine (at any given time close to 85% of Americans are at least slightly dehydrated and most of us are completely unaware of the symptoms). Fatigue is one of the most common symptoms of dehydration! 8-10 glasses of water/day is an appropriate amount for those who lead an active lifestyle (like us runners). Reduce stress as much as possible. This is obviously easier said than done, but trying to not sweat the small things is a giant step in the right direction. Don’t over exercise. Some folks exercise too much and ignore their bodies warning signs, as in feeling exhausted! One golden rule for those who cross train throughout the week is to try to alternate non-weight bearing activities (like swimming and biking) with your run (weight bearing) days. Try, try, try to get 7.5-8 hours of shut eye. This may be one of the most difficult of all the mentioned suggestions but it also makes the most sense. Make it a priority for a week or so and we’ll bet you notice the difference! Hydrate properly throughout the day, especially on your “non-running” days (off days are when we feel the least, therefore we hydrate less). When running for more than forty five minutes, sip, not gulp, about 3-5 ounces of cool water every 15- 20 minutes. Are you a wine or beer person at dinner? If so, then make sure to chase each glass with 4-6 glasses of water. Wear light colored technical clothing that wicks and transfers the moisture away from your skin. Cotton is no longer an acceptable material to wear when exercising in the heat, as it traps the moisture and tends to get heavy and chafe. This is true of your socks too! Try not to exercise outdoors after 8:00am.The most comfortable time of day to walk or run during the summer months is between the hours of 5:00and 7:30am. Wear breathable shoes…mesh NOT leather! Try pouring cool water over your head, along your neck and over your wrists just prior to your exercise. Listen to your body! Feeling nauseous or light headed are clear warning signs that you may be overheated or dehydrated. Try the “buddy system”…in other words, let someone know your route and approximately how long you’re going to be exercising just prior to heading out the door. Worn out running shoes. Heads up if they’re anywhere near the 400 mile mark! “Knocking around and hanging out” in addition to running in your shoes? If you’re practicing this “double dipping” (running AND wearing them all the time) approach to shoe wear, then you can only expect to be protected for about 200 miles into the life of your shoes! Improper warm up and cool down. The slowest part of your run should occur in the FIRST 5-7 minutes (try to average about a minute/mile slower than your normal pace for this portion of your run). The second slowest part of your total run should happen in the LAST 3-5 minutes…try to slow it way down as you “head for home”! This is actually one of the safest ways to properly stretch. A sudden increase in mileage. Follow the 10% rule (never increase your total mileage by more than 10% on any given week) and you will be golden! The toughest aspect of following this important rule is trying to ignore those false readings that tell you to “go ahead and run some extra miles or days”! A sudden change in pace. Speeding up and, interestingly enough, “slowing down” too much beyond your comfort pace zone can quickly lead to injury. It’s acceptable to target one day as your “fast” run and another as your “slow one” but changing your pace outside what you’re used to for any prolonged period of time (a few weeks or more) can punish your hips and knees! Improper shoe type. No, this doesn’t mean that runners get injured because they’re exercising in soccer cleats. What it does mean is whether your particular gait needs help with more cushioning or with more support. A person with rigid and stable feet will be out with an injury in just a few short weeks if they end up in a shoe that’s too stiff and stable. These under-pronator vs. pronator “mismatches” are the source of many injuries. This is actually what our professionally trained staff spends their day doing…analyzing gaits and correctly matching folks up with the proper pair of shoes! A change in your daily lifestyle. Adding more hours to your work week, getting less sleep, traveling more, adding more stress because of a personal crisis and several other challenges that sometimes seem to sneak up on us and are often unavoidable, can set you up for a running injury. How? Once again, because fatigue leads to inefficient gait mechanics! We often tell folks that running is simply a magnifier of what else is going on in your life. Shoes that are improperly FIT. Shoes that are too wide or too long can actually injure a runner’s feet, ankles and, yes even your knees. Since 2004 the trend has been for most of the shoe companies to cut their styles wider, so pay extra close attention to your fit. A startling statistic at Ragged Mountain is the fact that, in recent years, we have begun to actually sell more “AA” (narrows for women) and “B” widths in some of our shoe models than we do the normal/average width!! A change in terrain or surface. Folks that are used to flat country running find a new hillier environment to be quite physically tiring and mentally challenging. But what’s worse is that change from flat to hills (or visa versa) can actually lead to knee and hip injuries. Take it easy, especially on the down hills. A change from soft (gravel roads, golf courses or sand) to hard (sidewalks and roads) can send serious negative vibes to your shins and knees. The startling fact that concrete sidewalks are 20 times less shock absorbent than blacktop roads helps to really bring this point home! Overdoing it on your non-running days or running too many days each week. A common mistake made in this exercise happy town is not allowing your body to properly recover on your “off” days. Anything that is actually a “good workout” probably isn’t going to give your body the appropriate rest it needs. So, for example a 30 mile bike ride on your “off-running” days may give your knees and joints a break but the bottom line is that it still is tiring you out, which will fatigue you, which, once again, can lead to injury! The same thing goes for a cyclist, who would choose to run for 7 miles on their “recovery” day…the break is nice but it will still make them tired. 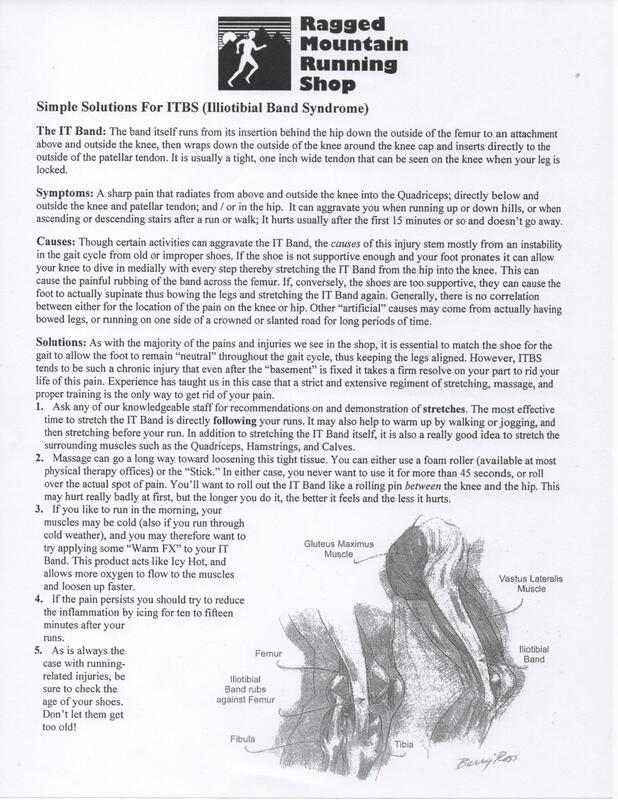 Illiotibial band Syndrome (I.T.B.S. )- This nasty, sharp pain to the outside of one knee (it rarely attacks both knees simultaneously) is truly a show stopping injury because is so painful that it locks you so you can’t fully extend or flex your knee! It’s especially apparent and very painful when running DOWN a hill or walking down stairs. The injury is particularly common among folks training for long distance races, like half and full marathons. The best ways to avoid or combat this common injury are as follows: A. Stretch on a regular basis. We have several stretches (we can recommend to you), that are specific to helping this injury. Using a foam roller or “the stick” (which we stock on a regular basis) seem to also help quite a bit B. Stay away from the side of the road as much as possible (as this leads to a leg length discrepancy and undue stress on one knee) C. Shorten your stride length (try to hit one foot 30 times every 20 seconds) D. Wear supportive shoes (arch inserts, like our Powersteps and Spencos, seem to also make a positive difference) E. Try to maintain a comfortable pace, as slowing it down or speeding it up too much seems to irritate this injury. 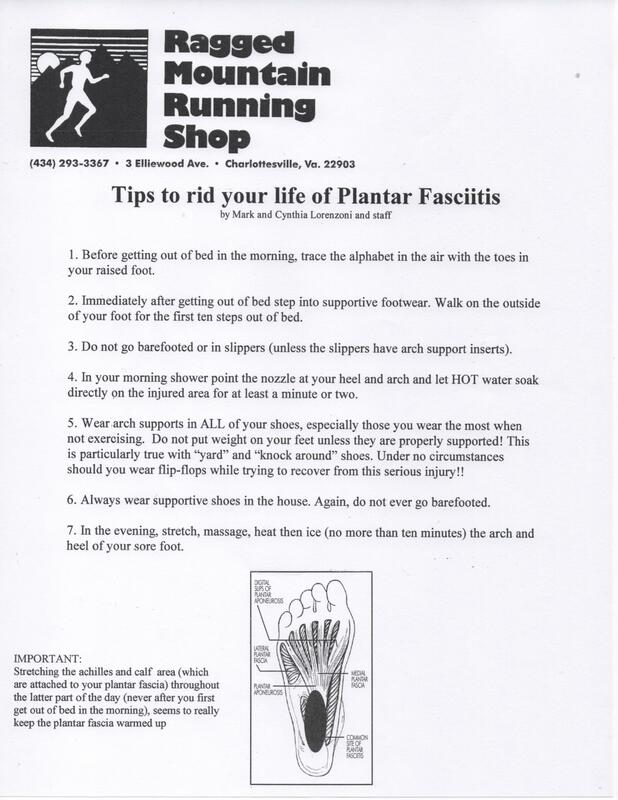 Plantar Fasciitis- Forget runners for a second because this just might be the most common ailment for the over 40 crowd…period! Ask any General Medicine Physician what the most common pain their patients (most of them non-exercisers) over the age of 40 complain about and they’ll usually put P.F. somewhere near the top! The most common symptom is a sharp pain to the base of your arch (back at the heel) when first getting out of bed in the morning or after getting up after sitting for awhile. Folks often confuse it with stone bruise and try to cushion the injury with a soft heel pad, which often offers very little relief. The best ways to combat this common ailment are: A.Wearing supportive shoes with excellent an arch support. This is especially applies to what you wear throughout the day at work. Adding an arch support insert usually helps boost the arch, which in turn makes a big difference. SuperFeet now makes two excellent inserts for women’s “dress shoes”, including a wafer thin but very supportive arch support designed to fit in those very high heels with tapered toes. Another very useful tool is the Counter-Force-Arch Brace (we have carried and recommended these since we opened in 1982), which is a velcro support wrap for your arch. B. Never, ever, go barefooted, even at home. C. Properly warm up your arch muscle by tracing the alphabet with your toes before you actually get out of bed in the morning or before you stand up after sitting for any extended period of time D. Apply heat in the morning (running the hot water from your shower nozzle on the base of the foot for a few minutes is a great technique) and ice in the evening (rolling your foot over a tennis ball container half full of frozen water for 6-10 minutes seems to really help). E. No sandals, flip flops or lightweight “Croc” type shoes as they usually offer absolutely no support! Knee and Hip Pain-There are all kinds of reasons (sudden increase in mileage or intensity, worn out shoes, change in terrain or surface) why running may cause some form of knee and hip discomfort but the type of pain you want to pay the closest attention to is when you’re hurting on only one side (ie. Right knee or right hip) of your body. This symptom usually means that you’re either not getting enough cushioning or enough stability & support from your shoes. It can also be caused by a natural imbalance (one leg shorter than the other) or from you running on an uneven surface (like the side of a crowned country road). Heat in the morning, Advil throughout the day and ice in the evening will usually help reduce the pain but you best bet is to stop by to see us with your shoes, so we can determine whether you’re in the correct shoes or whether they’re simply worn out. Stress Fractures- One of the tell-tale signs of a stress fracture is a throbbing pain to one small and isolated area (most commonly in your foot or shin). The pain seems to come and go at different times of the day, including when sitting, sleeping or driving. Regular icing and heavy amounts of Advil don’t seem to make a lick of difference and what seems to help best is rest (most stress fractures take a full 6-8 weeks to heal). Most often the injury occurs fro runners when they over train during or following a period of abnormal stress or fatigue in their life. Running usually can’t be blamed as the source for SCIATICA, BACK issues and FOREFOOT problems. Yes, running can magnify these troubles but taking a closer look at your daily routine or everyday shoes can usually help to eliminate these problems. A. The real culprit in most of the back and sciatica (a shooting pain, usually down the back of your leg) cases we see can usually be traced to poor and improper sitting habits. The car, the computer and the couch are three main sources of the dramatic increase in back and pinched nerve problems over the past decade, especially among the 40 and under crowd, which, historically, was an age where we rarely saw back issues. Mark is happy to give you some specific tips and advice on how to keep your sitting correctly, so as to avoid chronic back ache (stop by anytime). B. Neuromas and metatarsal problems (on the underside of the front of your foot) can quite often be traced to everyday shoes that either are too narrow, too shallow, have too much of a heel-to-toe ratio or don’t have the proper amount of support. It is surprisingly easy and inexpensive to take care of these two feisty foot pain issues. Our senior staff has become quite adept at diagnosing and addressing both a neuroma and a metatarsal problem with pads placed in the exact proper position on the insert of your shoe.